It’s been nearly fifty years since I heard the Byrds in concert. Their 1966 national tour included a performance in my hometown at the beautifully appointed and acoustically stunning Eaton Chapel of Beloit College. Not that I knew much about appointments or acoustics in 1966, but I do remember the Byrds sounded fantastic from where I sat just behind the balcony rail in that holy space. A deftly-played, amplified banjo can be a wonderful sound. The Dillards embellished that with a mandolin, various guitars, a stand-up bass and full drum kit. To my surprise they created a pleasant noise that was unfamiliar to teen-age ears fed a regular diet of top-forty radio. When they covered the Beatles’ I’ve Just Seen a Face, I was won over and filed their performance away in the “remember this band” area of my brain. Six years later while visiting friends in northern Wisconsin, our host placed a record album on the turntable. “You’ve gotta hear this,” Jimmy said as the stylus dropped into the leading groove. Amplified banjo picking, guitar strumming, mandolin, bass and drums. “This sounds familiar,” I mused while others settled into conversation, lit up joints or went to the refrigerator to grab beers. By the first chorus, “Redbone hound, come and get your belly up…,” I shouted to Jimmy, “Who is this?” He tossed me the album cover and my suspicions were confirmed. The Dillards were pictured on their new release, Roots and Branches. By the end of the week I’d bought my own copy at a local record shop. When you loan an album to a friend, you begin to understand the adage, “Neither a borrower nor a lender be.” By 1985 my Roots and Branches record had vanished into the lend-o-sphere. For years I tried remembering to whom I’d lent it. I would have borrowed Jimmy’s copy, but we’d lost contact. So, I began looking for another one to buy. No luck. Only recently I learned there were no versions of Roots and Branches available in any format thanks to a dispute involving the short-lived company on whose label it had been released. This past weekend, Sylvia and I visited our longtime friends Lynn and Bill in Rockford. On the way there we stopped at the Rockford Public Library East Branch. Inside that former Barnes & Noble bookstore building is housed not only a very busy library, but a unique enterprise, Kate’s Pie Shop Cafe & Records. Kate’s motto is “Cool Vinyl. Warm Pie.” The record store sells used, vinyl LPs and is managed by Stu. The collection is extensive and covers virtually all genres. The cafe, managed by Kate, offers fresh, homemade pies and coffee. It’s a fine combination, delicious to both the palate and the ear! While perusing LPs, Sylvia asked if I was looking for anything specific. “Yes,” I muttered, already flipping through a section of Classic Rock. “If you see Roots and Branches by the Dillards, let me know.” Within seconds of those words passing my lips, I had shifted over to the Folk/Country bin. Two albums in, and there it was staring back at me! Thirty years of searching dusty old record stores had finally paid off. Not fully recognizing the magnitude of my discovery, Sylvia wandered to the pie counter and selected some tasty slices for our hosts. I hastily pulled five bucks out of my wallet and stepped to the cash register, fearing someone would wrest the album from my sweaty palms before I could pay for it. That rare Dillards’ Roots and Branches album is now mine again, along with a medium slice of pecan-bourbon pie. Don’t count on me to give up either of them! I have the Dillards’ early “Back Porch Bluegrass” LP but haven’t heard “Roots and Branches” I found a few tracks on YouTube and love what I hear. 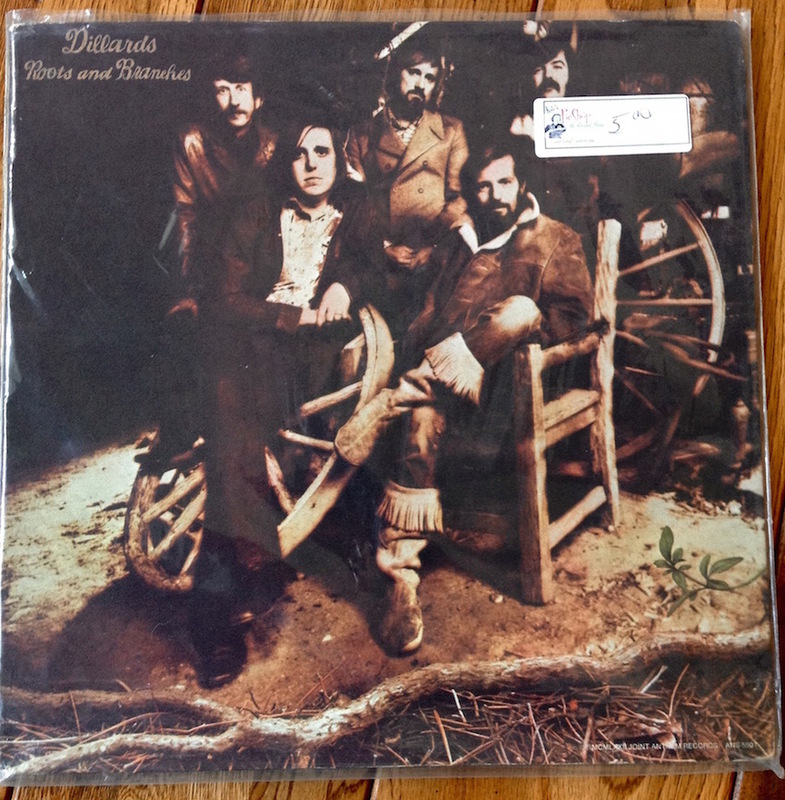 I’m a big fan of the Dillard and Clark album, “The Fantastic Expedition of Dillard and Clark” – a great melding of Doug Dillard playing and Gene Clark singing (along with some other great musicians, including two Byrds)! How I wish I could have seen the Byrds in 1966 (or any year)! 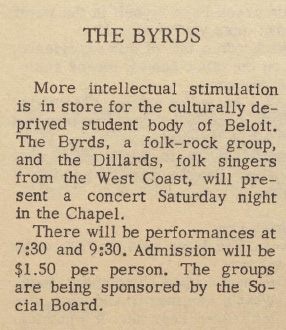 Somehow the “So You Want to Be a Rock ‘n’ Roll Star – Byrds Day- By-Day” book neglects to list the Beloit concert in Eaton Chapel! Thank you for writing about it.